I think I've had putting these bulb lights up in my backyard on my to-do list for ages but I still haven't gotten around to it. Mostly because I don't really want to deal with the hassle that I know it will be to get the wires and poles run up properly to hang them. Add this to next years summer to-do list. 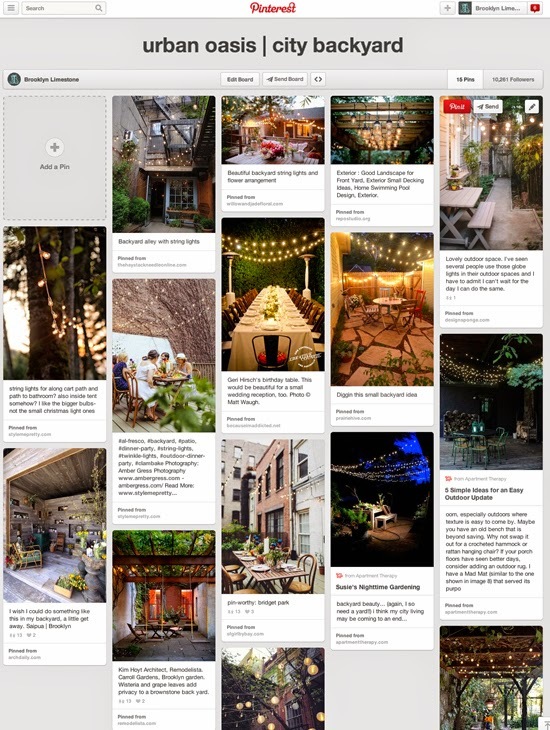 Until then, I'll just keep pretending to be productive by pinning them on my urban oasis | city backyard board. I know a lot of you have these lights in your backyard. Any suggestions for the best brands to buy? The best way to hide the ugly plugs? The best way to string them high and evenly? How often do you actually turn them on and enjoy them vs. maintaining? Would love to hear your thoughts! I strung mine up around our front & back porch when we moved in 3 years ago and they've been up ever since. I've had to replace a bulb here and there, but otherwise -- they are on every single night and we sit outside and enjoy them everyday. I just bought some at Target. I put them up last summer and absolutely loved the light that came from them. My husband added some thin cable wire which is easier to hang tightly and then lightly wrapped the lights around it. I recommend that. For outlets, we got an adaptor that converts a light fixture (next to our back door) to an outlet. Unfortunately, we left it plugged in for a long time which was probably not a safe plan. Eventually we blew the string lights and I'm not sure about the light on the house. So if you do that, make it a temporary solution! Have you considered the solar ones? Target has them and they are so easy to mount. You can have the solar charger in the ground or you can mount it up high. We did this using 3M outdoor tape and hooks on our pergola. So easy and no electricity required. They come on like clockwork every evening when it gets dark. They have different styles and I ended up liking the ones in little round metal cages. I have to smile when I read about your dread of the hassle of putting up a few strings of lights when I look at the work you put in to transform your home for just a few weeks at Halloween! You are SO crazy talented; you will not have any trouble putting the lights up, assuming you have an outside electrical source. I live in the Ozarks, so we do get a fair amount of snow and rain, and we've never had any problems. I know its weird right? I'm willing to put all this work into a temporary thing but not something more useful all season long. I can't even explain it - I just don't know how to hang them high enough (we don't have trees or even dirt to add stakes) so I havent figured out how to hang them and therefore I just don't. I bought two strings at a yard sale a few weeks ago for 3 bucks! My screened porch is elevated pretty high - we drive under it to get to our garage - so I strung them along the lower railing so they would be near the outlet. I didn't want to bother with extension cords. They look beautiful! My furniture arrangement hides the connections well. From outside they are high & from inside they give a pretty light to conversations from below. We sit on our porch in the evenings a lot & have most of our meals there. My lights have little fabric lanterns over them. So I'll take them down & store them for the winter. My porch is screened in from floor to ceiling so a little rain blows in if the winds is hard. that hasn't seemed to bother them at all. Just this very afternoon I went to three different stores looking for strings of outdoor lights and the only ones left were the ones with red dixie cups for light covers (not my aesthetic...). Of course I NEED them for a dinner party we are having tomorrow. I'm going to have to dig out the Christmas lights and improvise. Target carries a brand that are plastic globe lights and they look like glass from afar and definitely at night it is the same effect. In areas where you might get hail this is a safer bet and they are only $20 a strand. I would love some of these on my balcony! They give such a romantic atmosphere but unfortunately I heven't been able to find ANY here in The Netherlands! I want to do that too! I'll have to watch you to know how to do it! I got the Target globe lights (reviews said they broke easily, so we were careful, but didn't have problems!) I used an extension cord tucked in the eaves of our carport then strung them from the corner of the carport into nearby pear, pecan and crape myrtle trees. I had small zip ties at the ready, but each light has a little clip on it and we were able to secure them to branches with those. I've left them up all summer and absolutely love them! I don't turn them on all the time, but when I do, I enjoy them when I'm out there, and I enjoy the view of them from inside! I'm not planning on taking them down and I hope they'll survive! Thanks. So many people are recommending these to me so sounds like a good choice! Have you left them outside during the winter? We don't have trees we can hang them from so that's my main issue. I just don't know how to get them high enough. Made it SUPER easy to hang and also pack away for the winter. Ouch - $100 bucks! Is there something special about these lights versus the ones they sell for less? We didn't pay $100!! They were $23, but that might have been a lightening deal. I see they're showing at $60 now. Didn't realize things on Amazon fluctuated so much! They're commercial grade - which was one of the reasons we wanted them. And also one continuous length of 48 feet so no joins in the middle.